I was invited to spend a recent Saturday basket making with a group of women from my old home town. What a treat! Good company, summery refreshments, and a lovely day outdoors dedicated to creative pursuits. 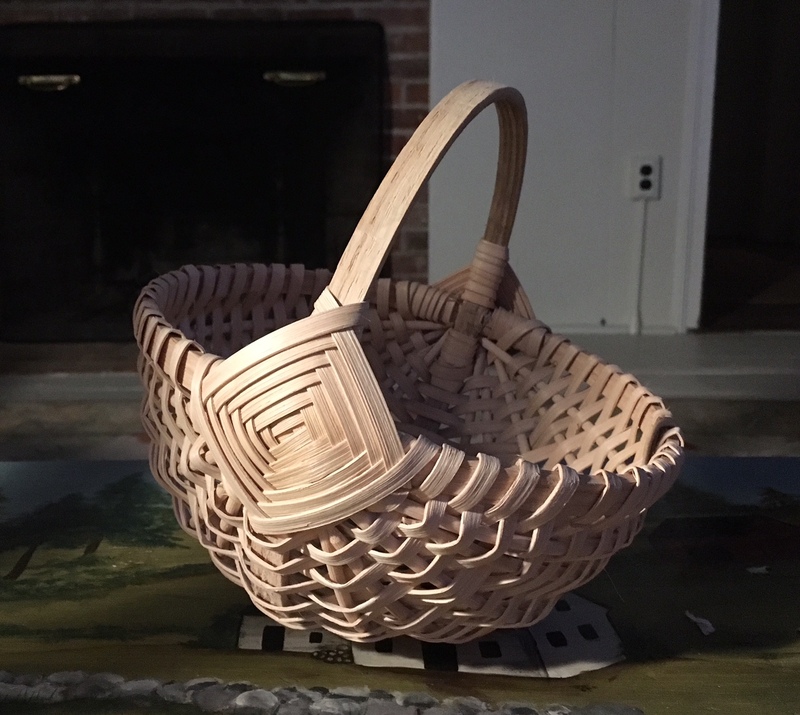 Basket making takes patience, I discovered, both in the weaving and in waiting for reeds to soak until they are pliable enough to work. I was glad I brought my sketchbook to fill the soaking time. 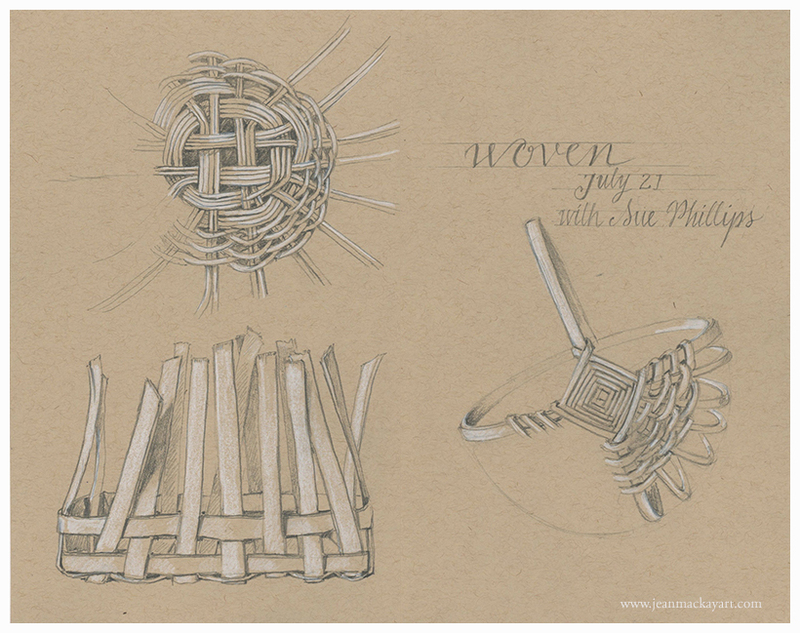 I came away with a finished basket and a sketch in progress, which I completed at home. Tips and Techniques: Toned tan paper proved perfect for this detailed sketch of a monochromatic subject. 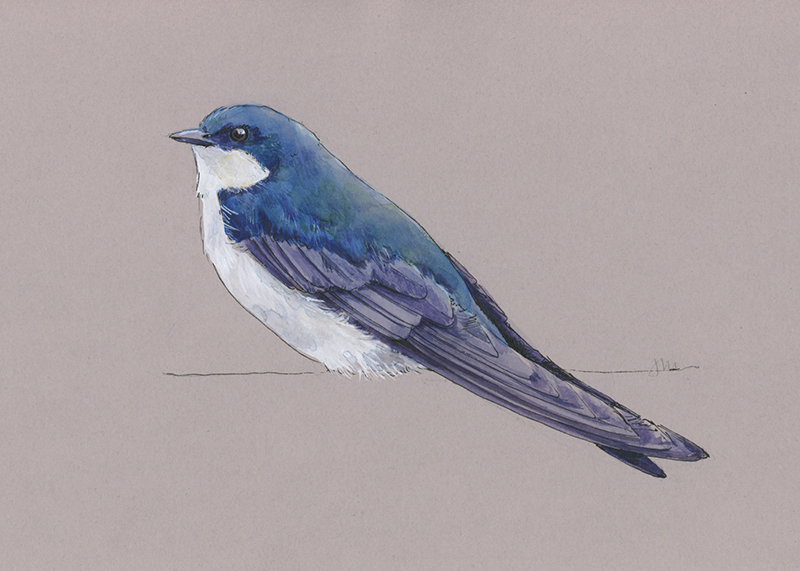 I used two pencils: F and 2B and a white Caran d’Ache non-water soluble pencil on Strathmore, 400 series, 80lb. paper. The precision of the weave led me to precision in the drawing and the text, but I didn’t feel it necessary to complete each basket. I like seeing the ribs and the work in progress. No need to make the entire basket twice. No turtle doves here this Christmas, and no partridge in a pear tree. Just two tree swallows and a bird house I’m giving as a gift. I started the first painting on traditional watercolor paper and then decided to paint a second to test drive the new Nova series toned paper from Stillman & Birn. Doing the paintings side by side gave me a perfect opportunity to compare papers while painting the same subject using the same materials and techniques. Which do you like for the gift? Tips & Techniques: The toned paper is 150gsm and labeled suitable for dry media, light wash, and ink. I used white gouache for the breast and regular transparent watercolor for the rest and was surprised at how well the paper took the paint. It buckled only slightly, so I kept the watercolors on the dry side. 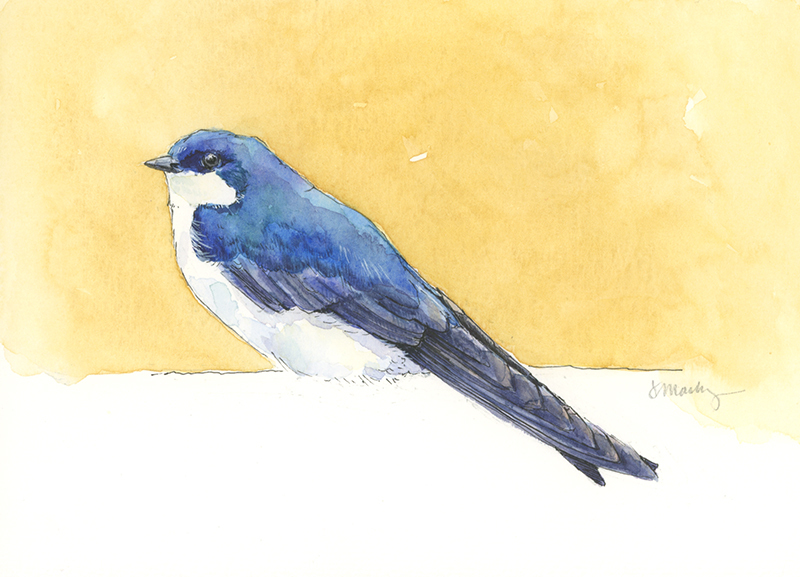 In contrast, the painting on watercolor paper (Strathmore 400 series 140lb) enabled me to work a little wetter. Here, I let the white of the paper serve as my white and added only pale shadows on the breast. Though the colors are cleaner on the white paper, I like toned paper for the impact of subjects like this that have strong whites. 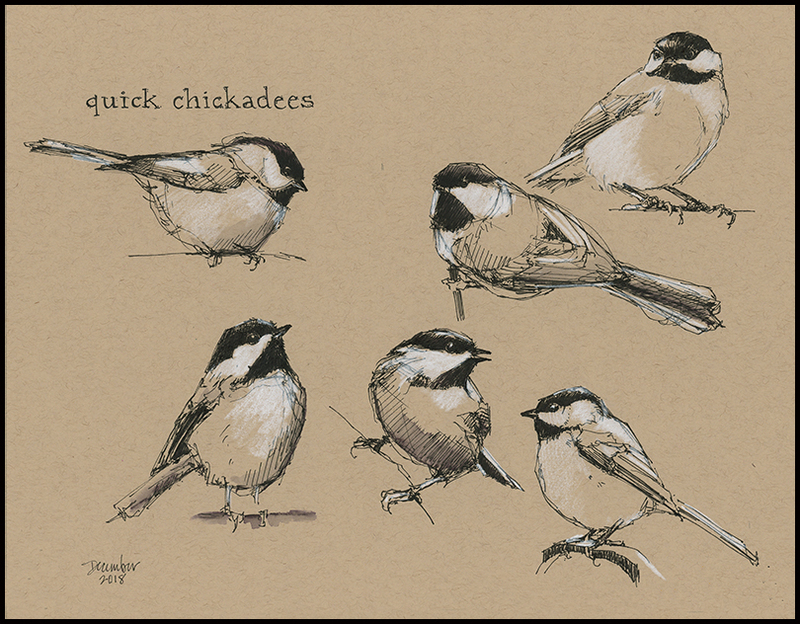 I wish the Nova paper was a little heavier, but I like it enough that I may do a series of birds on it. The pages of Birds Worth Knowing, written by Neltje Blanchan and published in 1917 are yellowed and worn. With a classic old book feel and scent, they remind me of cheap paper tablets used by elementary students learning to write. As a scientific historian and nature writer, Blanchan’s work is descriptive and thorough. Still, it sits on my shelf, year after year, untouched. Giving renewed purpose to a page or two seemed fitting. 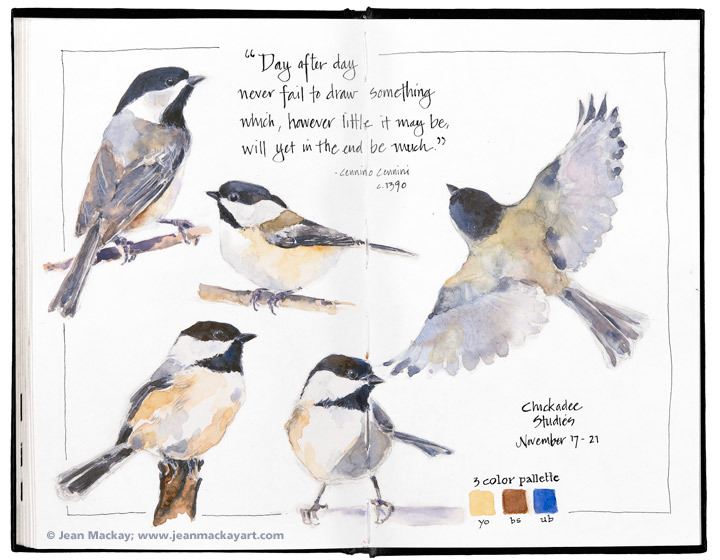 Tips & Techniques– I like to keep much of my day-to-day work in my artist journal. So when experimenting with different kinds of papers, I typically cut and paste them in. 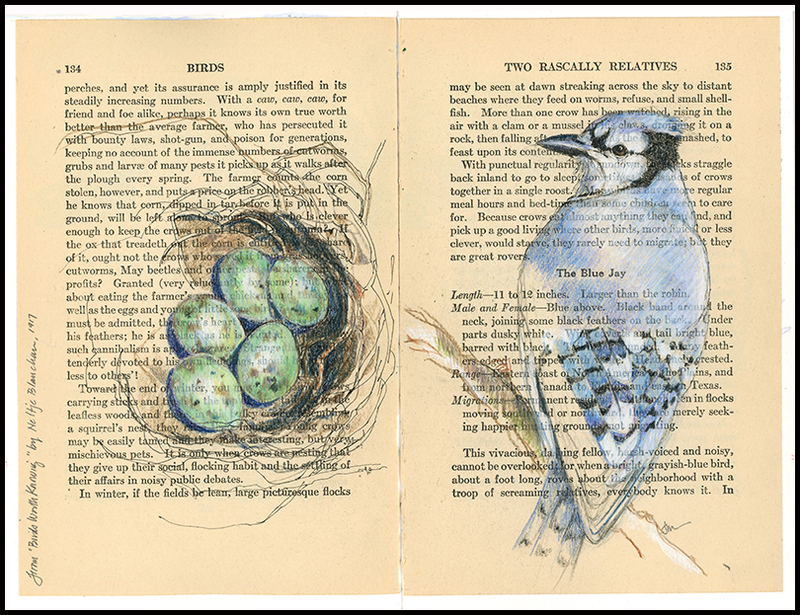 I sliced the pages cleanly out of the bird book with an Exacto knife and trimmed them slightly to fit my Stillman & Birn journal. I used permanent adhesive roller tape to bind the pages—it’s easy to use, clean, and flexible. Archival PVA adhesive also works well and might be best if you’re going to use gouache or acrylic paint on the page. Book pages are not well suited to watercolor. The hardest thing about drawing on book pages is seeing your initial lines, which get lost in the type and toned paper. I needed to go over a few pencil lines in ink to better define and see them. Subjects that have strong values from white to black work especially well and the possibilities for marrying book text and images are endless. I intentionally left the jay and nest unfinished, as I wanted the page to have a sketchbook quality. I recently went to a demonstration by an artist who specializes in charcoal drawings of figures and drapery. Totally not my interest, truth be told, but the elegance of light on dark paper inspired me to try using toned paper. The results surprised me. 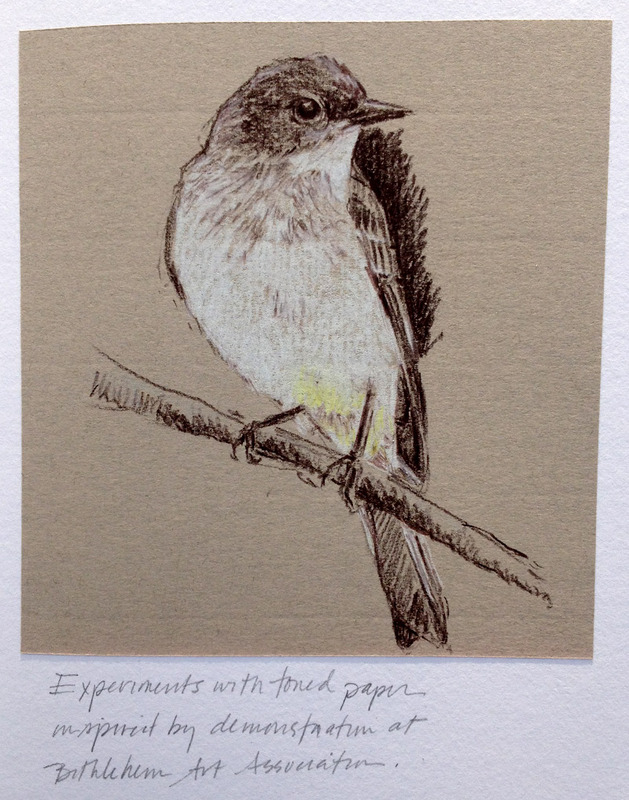 I liked the simple, back-to-basic quality of working with just dark (in this case, dark umber) and white to render the Eastern phoebe. Pulling light out of the toned paper felt like such a magical thing. 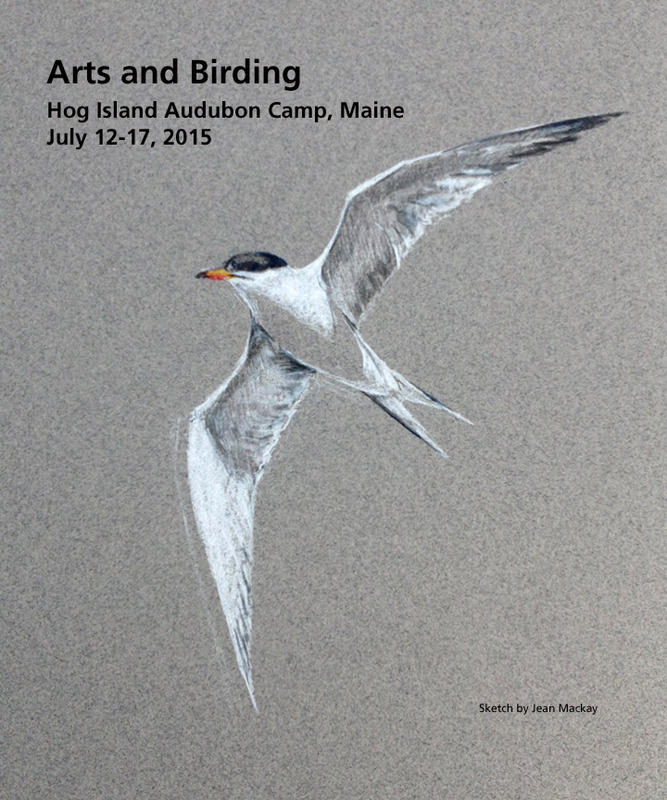 I wanted to see how it would be to bring a mostly white subject to life– hence, the common tern (below, with a plug for my Arts and Birding Workshop in 2015—registration is open!). Again, the simplicity of form and light really appealed to me. Since I usually work in just the opposite way— building up darks with watercolor on white paper— this change of pace is refreshing and fun.